I made a flageolet bean with vegetables as part of some dishes that I delivered today to a client, and reserved enough for our dinner. I used a recipe from a few months ago (May 2015) that I came up with as my base. Like in May, I soaked, rinsed, and cooked in my Instant Pot pressure cooker and cooked with enough water to just cover, not for 26m as before, but for 24m. I think that I can get by with cooking beans for less time than I normally do and am trying to fine tune this (there is no problem with longer cooking as the beans become more digestible, but why take the time and energy if not necessary?). After I let the pressure come down and could open the pot, I added fresh kale, and frozen mustard greens, broccoli rabe, collard greens, and butternut squash cubes, and cooked for an additional 2 minutes. I added raw onion, salt, turmeric, and ground cumin seed, as well as a little lime juice, and served. I made some Madagascar Pink rice and tried soaking the rice for a few hours before cooking (I've heard this softens the rice and possibly increases the bioavailability of the nutrients), discarding the soak water, and cooking as normal. I found some excellent organic heirloom tomatoes in the market a few days ago, and (after doing some still life photography yesterday) cut one up and served it with some fleur de sel salt. Dinner was very good! 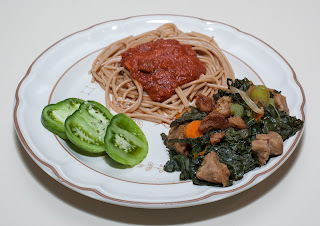 The beans, greens, and squash all went very well together. The squash was - well, squashed and smooth. I wonder how the mouth feel would be different if the frozen squash were cooked maybe for a minute under pressure to hopefully retain the cubes; in any case, the creaminess complimented the beans. I think that the beans could have been ready in even a few minutes less time, but no complaints about the softness of the dish. The rice was softer than usual. I actually like a little more bit to rice, but don't mind exploring soaking more. The tomato was awesome! My daughter and I were planning on collaborating on a waterless seitan and greens dish. We visited our local farmer's market today and picked up kale, but also bought an interesting sounding padrón pepper. The organic farmer said that the pepper tasted okay but not exceptional raw, but was great cooked. I found a nice and simple recipe online. I thought I'd blister these peppers as per this recipe, but not use olive oil. As we began to cook, I found that the package of seitan that I had was spoiled, though the expiration date hadn't passed. I'll have to exchange this unopened package. What to do - I wanted to otherwise include something like beans (but I was already cooking and didn't have beans ready - of course, I could have beans ready fairly quickly with my pressure cooker), tofu (but my wife doesn't eat tofu), or possibly tempeh (but my daughter doesn't like tempeh, though she sometimes enjoys smoked tempeh, which my wife doesn't love). Tasty Field Roast brand vegan sausages could work, and I happened to have some in stock. However, the variety I had was spicy Mexican chipotle, which would be way too spicy for my daughter. I do enjoy these vegan sausages, but don't eat them as much as I used to, as I am for no added fat dinners, and these sausages weigh in at 12g of fat per link. I ended up using one link and cooked carefully so that when I served, I could avoid the sausage and any of its spice in my daughter's serving. I had wanted to make a waterless meal by putting half moon slivers of onion, and then the sausage, and finally the kale into my large 3 quart Saladmaster stock pan. I saw nice onions at the farmer's market, but mistakenly thought we had plenty at home - we had none. Instead of using onion, then, I used garlic. 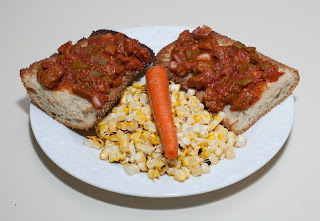 It was fun talking with my daughter about improvising when cooking. Here is what I did. 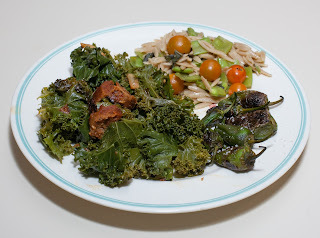 I put into my Saladmaster stock pan the garlic, followed by the sausage, and finally followed by the kale. I sprinkled the salt atop the kale, covered the pot, and brought it to medium high heat. After a few minutes, the steam started jiggling the vapor release. At that point, I reduced the heat to low until the jiggling went away and continued to cook for about 15m. When I was ready to serve, I opened the pot and added the tomato, and let it sit for a minute to warm a bit. I served the kale leaves only to my daughter, then served the whole combination to my wife and myself. I also made some whole wheat orzo cooked with a vegan bouillon cube. When the orzo was done, I drained it and added chopped fresh pea pods, as well as chopped fresh basil and oregano, plus some salt. I prepared the padrón peppers by warming a cast iron pan and putting the peppers into the pan. I didn't rinse the peppers; any germs would be killed by the heat. I cooked the peppers on medium heat; after a few minutes they started jumping, and I used tongs to turn them. As per the recipe that I found, I cooked until the peppers were well blistered and just getting a bit limp, then put in a bowl, sprinkled some coarse fleur de sel (salt) atop, and served. I coudn't resist trying a few before dinner, just grasping the stems and eating the pepper whole - wow, it really was tasty! There is a warning that most of these peppers are mild, but my wife did get one that was hot. We all enjoyed dinner. The sausage was spicy but added nice flavor. I loved the peppers! I want to pick up more of these peppers as I find them. I wonder if I can come up with other simple things to add, such as possibly chopped olive. As good as the meal was, I wasn't happy with the plate's appearance. It needs more colors, perhaps some bright red tomato slices or yellow squash. I'm delighted that my wife and daughter are back from a vacation of a little over a week. 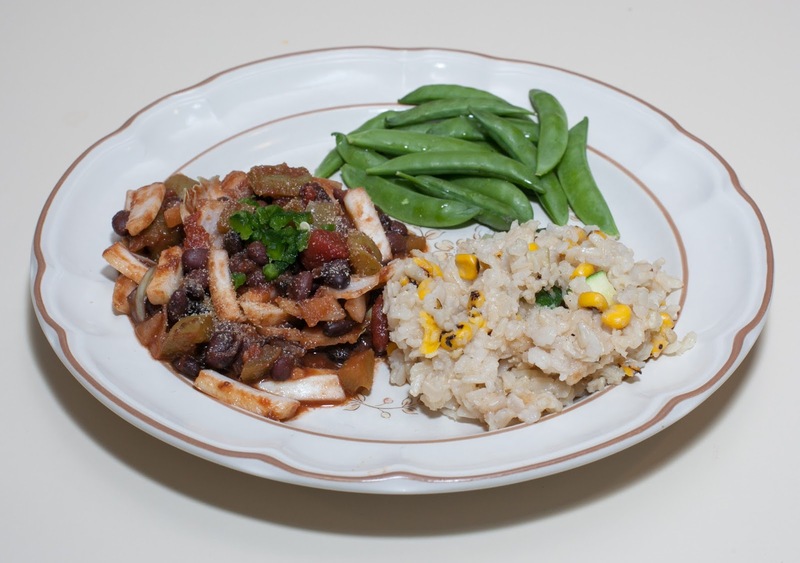 I decided to make a black bean dish, and it came out great! I had been having problems pressure cooking black beans which, soaked, are only supposed to take 10-15m to cook under pressure. Even at 30m of cooking and overnight soaking, the beans were always a bit hard. I usually would cook a few more minutes, but that didn't make a difference. I put the beans and water in the Instant Pot pressure cooker and cooked on high pressure for 20 minutes. The beans were indeed cooked though they weren't very soft. I drained about a half cup of the liquid - my wife said she would drink it with dinner. I added the bell pepper and marinara sauce, then cooked on low pressure for 2 more minutes. I opened the pot as before, after waiting a few minutes. I added onion, salt, oregano, nutritional yeast, and cabbage, and served. I also heated some leftover rice that I had made for a client - it was brown Jasmine with roasted corn kernels and raw zucchini. Tasty green peas completed the meal. The beans were excellent! My daughter finished her large serving, and my wife and I had seconds (I had thirds, too!). I served some jalapeno pieces and garlic salt with my wife and my servings. I am so happy that I now can make very nice black beans. Were I not cooking for my daughter, I'd add a bit of ginger and garlic at the beginning, and perhaps jalapeno in the short second 2m cooking. I had a busy day today, ironically dropping off meals for others but getting home and settled much later. It was pretty late by the time I could sit down to eat; I had some leftover split lentils from a recent pressure cooker demonstration, so decided to heat that in my toaster oven. I occasionally enjoy a frozen prepared stuffed paratha (Malaysian style) and had some stuffed with lentils. They have 9.5g of fat per paratha, but everything else in the meal was no added fat. 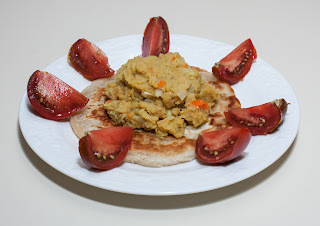 I heated a paratha, sliced some tomato, and served dinner with the heated thick split pea and vegetable dhal. I am preparing meals for some clients tonight. Typically, I just eat a little bit of each of the dishes over time as dishes become ready, and this becomes my dinner. Tonight, I decided to put several dishes together and, as otherwise usual, eat a plate of food. Tomorrow, by the way, I'm expecting a second Instant Pot pressure cooker - this one is a "smart" one that can be precisely controlled with scripts that can then be shared. Alas, I don't have a smart phone or tablet, so, for me for now, it will just enable me to prepare two pressure-cooked simultaneously, great for home, client meals, and my classes. I rinsed the beans then added enough water to just cover them, as well as the potato and bouillon cube, and cooked for 23 minutes in my Instant Pot pressure cooker. I added the greens and lemon juice. My client prefers bland food with minimal salt, so I added nothing else, but did add some salt and onion powder at the table. I also made some brown Jasmine rice (1 part rice to 2 parts water, along with a vegan bouillon cube; I put it in my Zojirushi rice cooker in the brown rice setting but otherwise could be simmered stovetop for 45m). When the rice was ready, I mixed in some roasted corn kernels and fresh zucchini. Finally, I had some pressure cooked tofu (tofu, carrot, water, and bouillon cube cooked at low pressure for 3m; fresh celery and a little salt added before serving). Dinner was good - I hope that my clients will enjoy these and other dishes that I am preparing for them. I need to keep these tasty giant Peruvian lima beans in stock - I think that this is my first experience with them, and they were nice, soft, and creamy. 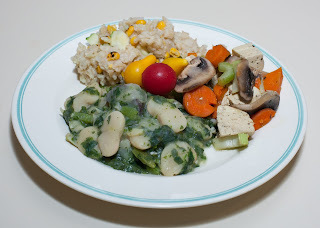 The beans went great with the potato.The tofu was good, though I wish that I had also cooked the celery. The rice was good; I'm not used to sticky rices, but still enjoyed this. The beans were fairly soft and I am sure that I could have gotten away with a shorter cooking time, perhaps 15-18 minutes. The potato was fine but also soft - it would have been fine in 15-18 minutes, too, I suspect. I only added vegetables to the rice because my clients like it that way, but plain rice would have been good with this combination. This week is a busy teaching week for me; I have four daytime middle school photography classes, I tutored photographic workflow and tonight taught an advanced digital photography class, tomorrow evening am teaching a photography workshop, Thursday evening am teaching an introductory digital photography class, and am probably doing some photographic tutoring over the weekend. I often like to eat out after my evening classes but came home hungry tonight, not having eaten dinner. Dinner was just for me. My daughter and wife are away this week - and, even if not, they would have eaten something by the time I came home. Once in a while, I like enjoying vegan Field Roast sausages, and picked some spicy chipotle sausages today, as well as crusty seeded ciabatta. I thought I'd experiment with a quick but tasty meal, seeing how the sauce for pizza could easily be made in the pressure cooker. I cooked all the ingredients except the shallot, oregano, and bread on low pressure for 2 minutes in my Instant Pot pressure cooker. Tomato sauce can sputter, so I gave the pressure cooker more than 10 minutes to slowly cool down then slowly let our remaining pressure and mixed in the shallot and oregano. In the meantime, I had lightly toasted two pieces of the seeded ciabatta. I simply topped the ciabatta with the sauce. I also made some corn off the cob with lemon juice and salt, and had some carrot. Were I cooking for my daughter, I might have added some vegan cheese. This dish wasn't no added fat, because the vegan sausage link has a significant 12g of fat. I'm excited that I designed a new class on pressure cooking and taught a 1-day version of it for the first time yesterday. I had great students and they all loved the class. I made a tofu and vegetable dish that we finished before I started working on a split red lentil dhal dish. I made a lot of food and had enough of the lentil dish that I heated up the leftovers for dinner tonight. The lentil dish was easy. I told my students to use a ratio of 1 part split red or yellow lentils to 3 parts water plus a vegan bouillon cube. Vegetables of choice could be added (if a lot of vegetables, a little more water could also be added) and then cooked in the Instant Pot pressure cooker for 8 minutes. 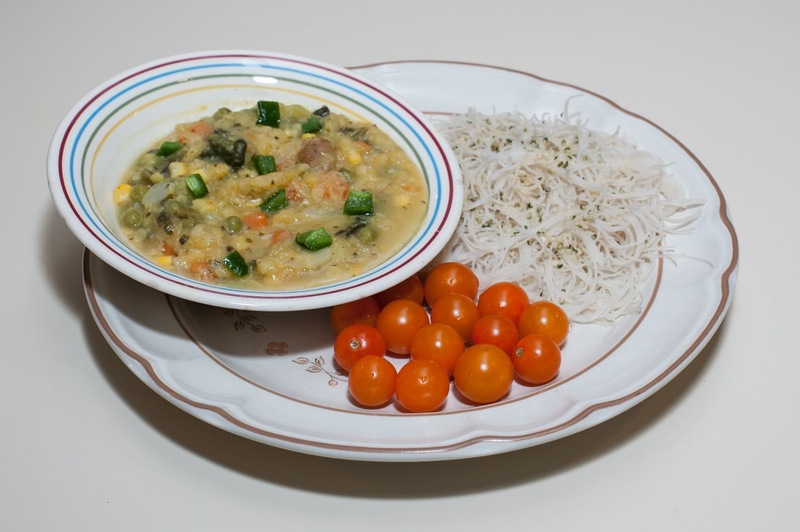 This dhal had quite a few vegetables, such as Brussels sprouts, corn, peas, carrots, broccoli rabe, and more. I added some ginger, salt, and maybe 1/4 of a lemon to give it a very nice fresh, citrus addition. We all loved what the Instant Pot did to make the dish. My wife and daughter are away this week, so I'm cooking for myself. 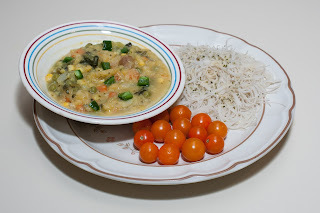 I served the leftover dhal with some chopped jalapeno. I quickly boiled some brown rice noodles, topped them with hemp seeds, and served some tasty sungold tomatoes for a tasty dinner. We just got back from almost a week in Washington, D.C., where I had a day with some fellow Food for Life instructors for updates to our training, then spent several days at a fabulous cardiovascular health conference. I so wish that information about whole food plant-based diets were more readily available to allow people to make good food choices to prevent and manage disease. We had, as always, great food in Washington, including meals at Native Foods (I didn't like the small Washington, DC location compared to ones we've eaten at in Southern California and Chicago), Pizza Paradiso, Dukem Ethiopian restaurant (we'd regularly go to Meskerem, but it suddenly closed, alas), a wonderful but pricy $65 gourmet vegan tasting meal at Equinox, and wonderful deep dish pizza (vegan Daiya brand cheese included in my daughter's half, cheeseless on mine; as always, we remembered to call several hours early to ensure they'd have some vegan dough) from District of Pi. The conference and instructor's summit had excellent food, as always. 1t (or more, to taste; were I not cooking for my ginger-averse daughter, I'd use 2 or 3t) finely diced ginger to pieces smaller than 1/4"
I put the lentils (which I should have first rinsed, but forgot), water, bouillon cube, sweet potato, carrot, salt, and ginger into my Instant Pot pressure cooker and cooked for 15 minutes on high pressure (red split lentils generally cook under pressure for 13-18m - 25m cooked conventionally stovetop - and with a 1 part lentil to 2-2.5 part water). After a few minutes, I slowly let out remaining pressure and mixed in the remaining ingredients - the turmeric, onion, Napa cabbage, lemon juice, and kala namak - then served. 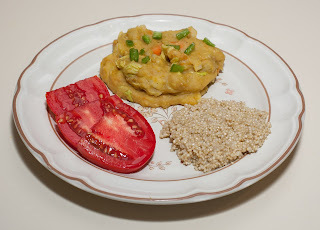 I also made some simple quinoa and served some so-tasty summer tomato slices. as well as watermelon-strawberry juice that I blended. I had aimed for a thick dhal, and was pleased that the pressure cooker nicely achieved this. If anything, it was just slightly too thick and could have used maybe an extra 1/4 or maybe 1/2 cup of water. Everybody enjoyed the dhal. I liked how the Napa cabbage softened just a bit as I mixed it in, and added a welcome crunch to the dish. Cooking tasty and nutritious split lentils and, even faster, split peas, is so easy in the pressure cooker. I should continue to come up with dishes like this one but experiment with other vegetables to see if they can nicely combine to create welcome new dishes. Small pieces of tangerine would have been interesting in this dish, and some potato instead or even in addition to the sweet potato could have been fun. I'd add maybe 1/4 or 1/2 cup more water to this recipe, as suggested above.